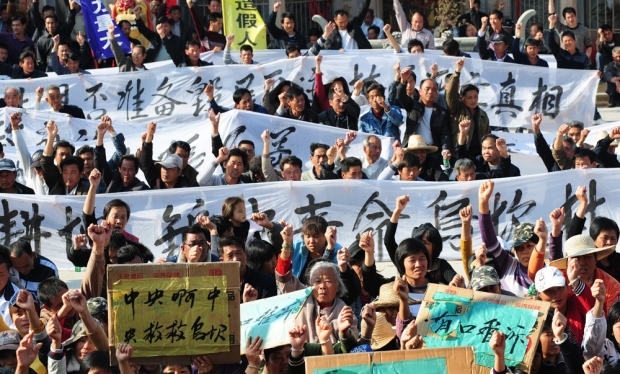 Villagers hold banners during a protest rally by residents of Wukan, a fishing village in the southern province of Guangdong, as they demand the government take action over illegal land grabs and the death in custody of a local leader on December 19, 2011. The village of around 13,000 inhabitants accused local officials of stealing communal land without compensating them, with anger boiling over after the death in police custody of a village leader tasked with negotiating with authorities over the row. For the last few days, international attention has focused on the small fishing town of Wukan in southern China, where villagers are in open revolt. Simmering tensions caused by corruption and illegal land sales have escalated into an armed uprising by locals against security forces and local government, both of which have been driven into at least temporary exile. Starting with the question of what exactly is happening down south, our conversation on Sinica this week eventually turns to a more general discussion of how China’s liberal intelligentsia seems to be grappling with the idea of reform: is it possible and what might it look like if it ever arrives? Joining Kaiser Kuo and Jeremy Goldkorn for this discussion are Charlie Custer of the excellent translation blog China Geeks as well as Ed Wong of The New York Times. We’re also delighted to have the stalwart Gady Epstein back with us, now in his new role as China correspondent for The Economist.